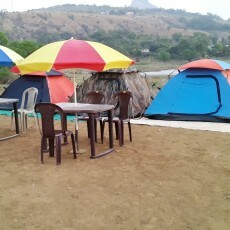 Camping at Pawna Lake is a quick adventure that offers you a serene getaway into the forested mountains of Maharashtra. A perfect way to rejuvenate and relax, this camping trip will take you away from the city life and transport you in the midst of nature on the banks of the Pawna Lake. Try your hand at volleyball, challenge yourself to match of cricket, test your brain with chess, have fun with a game of carom and darts or simply sit back and relax to the sounds of nature. At night, you will gather around a bonfire, listen to music or enjoy a fun session of star gazing while munching on barbeque snacks. With easy accessibility at a great location, this camping experience is a great way to spend quality time with your friends or family. Nestled in a lap of nature, your campsite lies in the open grounds just outside the Thakursai Village. 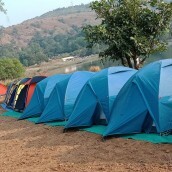 Located at close proximity to major cities of western Maharashtra, the campsite is a popular destination for campers looking to spend quality time away from the city life. You will stay in the midst of hills painted with shades of brown and green to rejuvenate your senses with scenic beauty. Catch a glorious view in the evening as the sun begins to drown in the still waters of the Pawna Lake and drift into sleep inside tents pitched in the wilderness of nature. 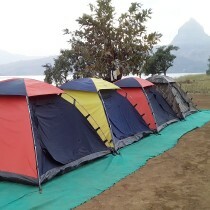 • Spend a night in tents camping at Pawna Lake. • Have fun with friends and family around a bonfire. • Participate in outdoor games and activities. • Catch great views of the Pawna Lake. A basic level of health and fitness is required to book this camping trip in Pawna Lake. This is a non-strenuous activity. However, if you have any cardiac or respiratory conditions, or suffer from knee or spinal problems, please consult your doctor before booking this trip. For cancellations made more than 24 hours prior to check-in date of camping at Pawna Lake: 65% refund. For cancellations made less than 24 hours prior to check-in date of camping at Pawna Lake: No refund. Check-in time at the campsite is 15:00 hrs and check-out time is at 11:00 hrs. Accommodation for children below the age of 5 years is not charged. Accommodation for children between the ages of 5 to 12 years is charged at a discounted rate of INR 700. Accommodation for children above the age of 12 years is charged at full price. Day 1 of Camping at Pawna Lake: Check-in and enjoy! Arrive at the campsite by the Pawna Lake by 15:00 hrs. After some hot tea and snacks, spend the rest of the day at leisure. You can try your hand at badminton, challenge yourself to a game of volleyball, test your mind with chess or give carom or darts a try. Once the sun sets, gather around a bonfire and enjoy a session of barbeque with your fellow campers. After a scrumptious dinner, retire back into your tents for a night of restful sleep right in the heart of nature. Overnight at Pawna Lake in tents. Wake up at leisure and catch the early sun as you go for a short morning walk around the campsite. After breakfast, pack up and check out by 11:00 hrs. Your trip ends here. 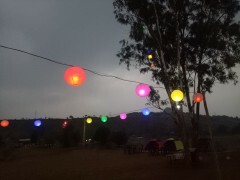 Evening at the Pavna campsite are always fun! Overnight at Pawna campsite in tents. Check-in time at the campsite is 15:00 hrs. You will be accommodated in tents on a twin/multi-sharing basis. The tents come with sleeping mats, pillows, blankets and foam mats. The campsite is equipped with common kitchen/dining and toilet tents. Today's meal package includes evening snacks and dinner. You will also be served barbeque snacks during the bonfire. Dinner will be paneer curry, chicken curry, dal-rice cooked in traditional style. Today's meal package only includes breakfast of tea and poha. Check-out time at the campsite is 11:00 hrs. The campsite, located outside the village of Thakursai, is accessible via road from Lonavala (14 kms), Pune (52 kms) and Mumbai (105 kms).